The storage of cost-effective electrical energy is hindered by the nature of the battery. Among existing technology, Li-ion batteries (LIBs) are considered to be the most promising owing to their large energy storage densities, power capabilities, and long life cycles. At present, the utilization of Li-ion batteries is expanding from small-scale applications, e.g. mobile phones and consumer electronics, to large-scale applications, such as hybrid electric vehicles and utility grids. However, it is estimated that the lithium reserves will not be sufficient to support this expansion, and LIBs are relatively expensive for large-scale applications because they use transition metals (e.g. Co, Ni) in their electrodes. Organic rechargeable batteries (ORBs) are an attractive alternative to LIBs because they use sodium, which is relatively abundant, and have low unit costs of production. Furthermore, organic electrodes have several advantages as compared to their inorganic counterparts, including greater ease of tuning material properties, enhanced safety, higher power capabilities, and being more environmentally benign than their metal-oxide counterparts. develop a series of ORBs using redox-active organic units. fabricate and test ORB devices. 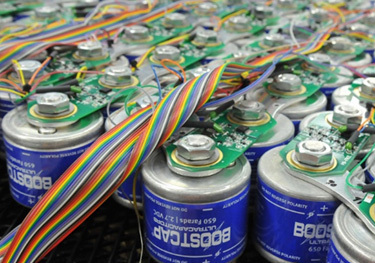 develop organometallic cage compounds for batteries. Carrying out these extensive studies will not only enable us to develop new technology to implement in batteries but also provide valuable information about how making structural modifications to molecules impacts the battery performance. Wang, Y., Frasconi, M., Liu, W. G., Liu, Z., Sarjeant, A. A., Nassar, M. S., ... & Stoddart, J. F. (2015). Folding of oligoviologens induced by radical–radical interactions. Journal of the American Chemical Society, 137(2), 876-885. Chen, D., Avestro, A. J., Chen, Z., Sun, J., Wang, S., Xiao, M., Algaradah M. M., Nassar, M. S, ... & Meng, Y. (2015). A Rigid Naphthalenediimide Triangle for Organic Rechargeable Lithium‐Ion Batteries. Advanced Materials, 27(18), 2907-2912. Wang, Y., Sun, J., Liu, Z., Nassar, M. S., Botros, Y. Y., & Stoddart, J. F. (2017). Radically promoted formation of a molecular lasso. Chemical science, 8(4), 2562-2568.